Fry, sear, scramble, and saute all of your signature dishes in this versatile 12" aluminum fry pan! With a shallow, curved wall design, this pan allows for easy stirring and prevents steam from forming in the pan. This pan is very solid and heavy, and also oven friendly. Only gripe is that the lip is easily dented since it is flipped outwards. Great fry pan, we use this on the burners and also in the oven for our Vesuvio dishes, they hold up well, we get about 18 months on this size, rivets are solid, can't beat the price. This pan as well as all the other sizes in this line can not be beat for thier quality and price. These pans are heavy gauge aluminum that heat evenly and clean up very easy. If I where to find something to complain about it is that the handles can become very hot, but that is what pot holders are for. Best bang for the buck anywhere. Great frying pan for the price. Competitor price for similar product substantially higher. Holds up well in high volume establishments. I will order again. No negative customer feedback. I am so happy to have found these pans. They are so great and a must for every kitchen. I will recommend these to everyone. If you're looking for a value priced fry pan, this is a great choice. It heats evenly and the handle stays cool. The material is aluminum, so not as durable as stainless, but for the price hard to beat. This is a perfect size for our restaurant and the kitchen staff loves working with them. We will def be buying more in the future. great deal for the pan. you can not get a pan this cheap any where else. The handle gets very hot, so always cook with a towel in hand. Quality frying pan. We use these pans in two high volume restaurants. They are durable, easy to wash, and have never given us any trouble. We have purchased an estimated 50 of these pans and plan on continuing to purchase more. The choice 12 inch aluminum fry pan is a quality product, it heats evenly and holds temperature very well. I would recommend this product to anyone looking for a great pan! I love these new pan. Works great for my frying needs. Stove top to oven makes it even better for all your kitchen needs. I'd suggest this pan to anyone. GREAT PAN FOR THIS PRICE! 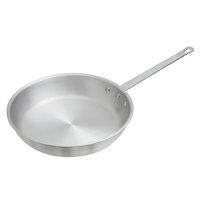 We have bought a few of these pans in different sizes from The Webstaurant Store and will keep coming back. They are very well made, Our pots and pans get a workout and they hold up well. Great buy for the price! This pan is heavy duty with a long handle that doesn't get hot when cooking. It also cleans up easily. This is great basic pan for commercial kitchen use. 12 inch diameter allows for the space to cook foods evenly without crowding. Good all purpose pan. Great pans that are able to withstand high use. I would recommend purchasing the removable silicone pan handle grip in conjunction with the fry pan as there is no sort of grip on the pan and the handle gets very hot. Is this the best pan ever? No. Is this the best pan for the remarkably low price-point? Yes. This pan is an everyday use work dog for line cooks to throw around and generally abuse. Buy it in lots of 6 and make sure that your staff knows to scrub the carbon off of the bottom to ensure its longevity. Or not, and just buy another lot of 6 for 30 bucks. I am pretty impressed with this 12 inch aluminum has a good gauge thickness the sides on it or a little higher than normal sautéed which I like and it's a good buy. Been working good! Best 12 inch skillet I have ever owned. Its Easy to hand wash. Food Rarely sticks to it. And it distributes heat evenly. I will definitely buy it again. My husband and I enjoy this 12 inch Aluminum Fry Pan. It works really well and is easy to keep clean. Much better then the toxic non-stick pans. I am pleasantly surprised at the quality of this pan considering the price. Heavy without being unruly. Thick and seems made to last. The handle does get HOT so you must use something to protect your hands when grabbing it. The handle is very securely attached. Had to try a different size and am glad I got this large pan! It holds a lot of food and cooks just as well as its smaller counterparts! A big sized saute pan that definitely has some weight to it. Good for when you have to sear a lot of stuff at one time. Feel like it will last a long time. Cleans up well use for Fettuchini Alfredo and pan sautéed fish. Would recommend and the price was very reasonable compared to other web sites. Would purchase again when needed. Nice fry pans. They work just fine for us and they are so reasonable in price that they can be replaced as needed. They are not a thin pan. One of the best 12" Aluminum Fry Pan that i got i like the durability of this fry pan great to use for everything love it !!! These are nice. The coating could be a little bit better on the. Will probably get a year maybe a bit more out of these pans. Amazing value at this price. Ordered a few to see the quality and was satisfied with them I will be ordering more of these for sure!! Would not recommend this, constructed well, but, the pan heats too quickly and is not reliable in overall cooking, hard to clean, just not good for our restaurant. This fry pans are absolutely amazing for the price. They are heavy duty. They have lasted great under heavy use with no sign of a problem. This a well made, heavy duty frying pan made out of thick metal. It is great for larger meals, and it cooks fast and even. My first all aluminum pan. Works great for sauces and sautéing. Quality through and through. I highly recommend it! Haven't had much luck with eggs and "sticky" foods but I'm still learning. I love this online store. Great prices and quality products! Great quality thick bottomed pan. You cannot beat it for the price. we use it on a daily basis and is a great size for multiple portion cooking. If you want to get a silicone handle to slip over the exposed metal handle of this pan, then you should probably buy the handles designed for 14" pans instead of the ones designed for 12" pans. I wasn't able to fit the 12" handle cover, but the 14" cover went on nicely. I ordered this pan for my home use as I needed a bigger pan than my regular 12 inch. The pan has held up wonderfully as I have been putting it to use with several dishes at different heat levels. A very nice pan for my uses. This is the workhorse of the 407 series in my book , super heavy duty. When you step up from the 10" to the 12" there is a big difference. I use this bad boy on my outdoor 135,000 btu burner with no problems or warping. If you are planning to buy this fry pan, you will make a very good decision. I would recommend this good fry pan to everyone. Purchased this frying pan along with a number of other similar items and was impressed with the level of quality in it's construction. A sturdy cooking tool that does it's job well and at a phenomenal price! This aluminum pan is pretty big and is great for sauting, sauces, gravies and other like things. They are also durable and price just right.